This is a Northern long-eared owl. I like this one. He looks most realistic so far, of all my owls. It’s because of all the hatching. I don’t really have the patience for that sort of thing, though? I remember back in the day I’d read Kris Dresen (Calamity Jon’s friend) and her comics had SO much cross-hatching in them, she said they would take forever. Of course I’m also only working with two pens and a mechanical pencil, just office stuff. So clearly I’m at a disadvantage, and anything I do is therefore extra-awesome. On Monday I had sewing class, and I gathered my skirt and attached it to the bodice and even put the zipper in! I didn’t think I’d get all that done, but I did. Lots of ladies were doing gathering that evening, it was a gathering coincidence. I’m hoping to finish the dress tomorrow (Friday,) and then on Sunday, which is Mother’s Day, Lynn & Ralph are going to come over but Lynn said she didn’t mind if I did sewing. So I’ll work on my petticoat and chat with her. We haven’t seen them since they left for Florida in . . . January or February. It will be good to see them. See, now I thought that I had real actual things to say, you know? Something to talk about, not just a dry boring run-down of what I did this week. But now it’s been too long and I can’t remember. Boo. I haven’t been very productive at work lately, and it’s a circular rotating trap. 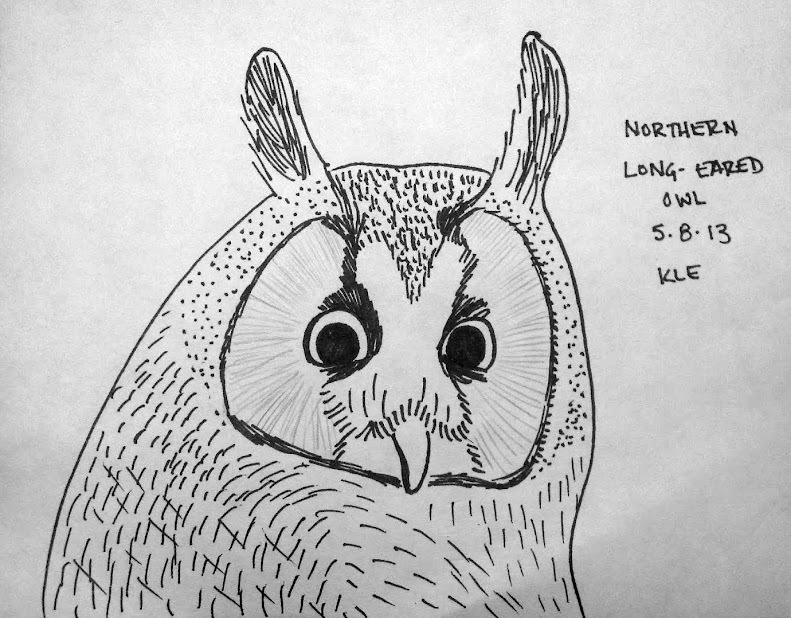 But then on Tuesday I drew that owl and it made me feel like I had done something. And I mean it only takes me like five or ten minutes, but I just felt . . . I dunno. Something. So I’m going to keep on drawing these owls. My life is about to get super-crazy. Lisa’s Bachelorette is this weekend, plus also Mother’s Day, Monday I have sewing class and Tuesday I have a (legit) planning board meeting and then on Wednesday Jeff and Steph arrive! And then it’s busybusybusy for the month of May. New Star Trek movie, the wedding, going up to Hawley (if my boss allows me the time off,) Chris’s birthday BBQ. It will be so great to see Jeff again. And I’ll have to try to squeeze my regular life in when they’re doing other things. I sure do like that he/they will use our home as a home base, though. It’s nice to just . . . sit around and hang out, sometimes. Not just at parties. I shall draw another owl today.